Why Galaxy Note AMOLED screen breaks easy? Ever wonder why Galaxy Note 3 screen ends up with dead screen yet the glass is in perfect condition? That is because Samsung uses thicker glass to help from breaking, but that impact to the glass it transferred to AMOLED thus AMLOED ends up taking the impact causing internal damage. See the video. iPhone 6 size. How big is it? Got the iPhone 6 case ahead of iPhone 6 release. Quick comparison to iPhone 5. Size looks just right. If this is real iPhone 6 screen, it shouldn’t be too hard to change the front screen out. It looks like the glass has curved edge. Notice the angle of the LCD connector. I wonder why they do that. Will there be new type SIM? Will iPhone 6 adapt it? There is another rumor that iPhone 6 may adapt new type SIM card. Can they? Picture shows regular, micro, and nano but is it really necessary to bring in new type? 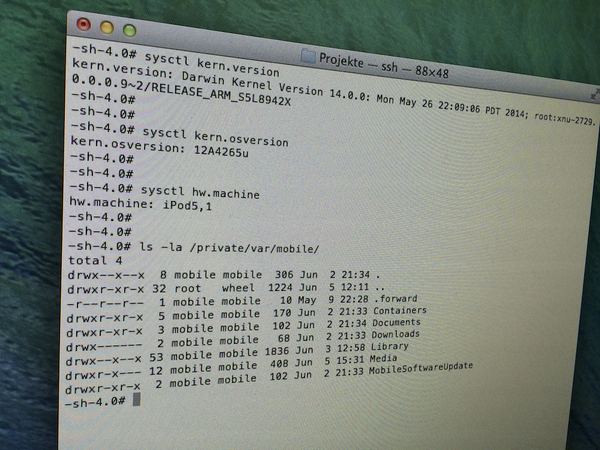 I0n1c shows ability to SSH into iPod Touch running iOS8 which is a good news. But this is promising news because we will see public jailbreak once iOS 8 is released publicly by Apple. iPod Touch battery : See what happens when it reaches the end. Please note this is possible only when digitizer and LCD is still working.